I was cooking dinner last night when I realized how much I miss blogging, so I made our veggie side dish look as pretty as I could and snapped a picture. My new website was derailed and is being re-railed (I don’t know if that’s a word but I’m using it.) with a more Ingrid-friendly program that I can maintain on my own. The fact that my husband, who is my website builder, is so busy on other projects is a very good thing, a dream come true, actually, because it means that his business is on fire. I love it, but am sad that I’ve been back-burnered and so has my blog. So now it will be up to me to get it finished when he finishes setting it up for me. In the meantime, to appease my urge to gab about food, since WordPress says I am over my limit on uploads, I am posting without a picture. Though I will post one of the finished dish on the Edible Tapestry Facebook page. I think I will sleep better tonight having posted something here. My husband is doing very well eating his veggies these days. I didn’t think he had much weight to lose at the time of the heart attack, which I’m sure people who read my blog are sick of hearing about, but his health is what our lives have revolved around for the last three months. He has lost over 40lbs., however, and is fit as a fiddle. We even joke about the 6-pack that is lying under a tiny belly bulge that used to be a spare tire. He also graduated from cardiac rehab. last week, so that is another thing to celebrate, though I wish he could be monitored so closely every day of his life. And the final verdict on the heart attack from a cardiologist that he had yet to see is that he has brittle arteries with no blockage and high blood pressure but perfect cholesterol. It’s frustrating. I don’t think they know at all. If every dr. he sees has a different opinion, then I really don’t think they have a clue. We are not convinced that he is out of the woods and that this can’t happen again at any time. So staying in tip top shape and keeping his blood pressure down, exercise up, veggie intake high, is so important. The last thing he needs is an unhealthy diet that will start causing plaque build-up and he can never, ever be sedentary. I just take solace in the fact that his heart is strong, wasn’t damaged while it was in duress, and that it isn’t faulty. I look forward to a long, yet edge-of-my-seat kind of life with him. Recently, he ate yellow squash for the first time when I sprinkled it with garam masala and grilled it, so last night I decided to grill zucchini with some other vegetables to see how he would like it. Before I had a chance to ask if it was even palatable, I looked at his plate and his vegetable stacker was GONE. Yes!! This has been harder than getting kids to eat green stuff, but he’s being very open-minded and his likes and dislikes are changing. I’m so proud of him. But I did add several flavors to make it taste better. I skipped the salt, as I tend to do these days, but brushed the eggplant with extra virgin olive oil, then seasoned with thyme, garlic powder, and pepper. Before I plated the vegetables, I drizzled balsamic vinegar and extra virgin olive oil on each plate. Then I stacked the veggies and gave each serving a few parmesan shavings and garnished with a big basil leaf from the garden. I stacked the basil leaf on top of mine before digging in and it made it. It may sound odd, but because of the texture of the eggplant and all of the flavors combined, it reminded me of a layered pasta casserole like lasagna or eggplant parmesan without all the heart damaging goo. And it’s such an easy no-brainer side dish. 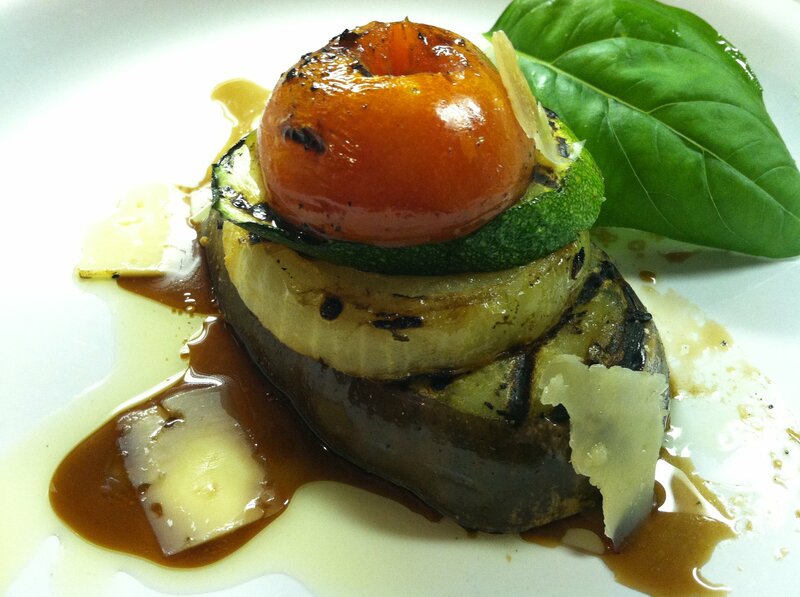 I used thick eggplant slices and Spanish onions, zucchini sliced on the diagonal, and fat cherry tomatoes cut in half. And everything came from the garden but the onions. My boys love that, though one refused to eat his eggplant. In fact he pointed to it and said, “Please tell me I don’t have to eat that.” with a pained expression on his face. Okay, maybe a little tomato sauce and melted parm. on his next time. While I am a latecomer to your blog I’m glad to hear your husband is recovering. You’re right too about doctoring. There are probably as many opinions out there as there are doctors. Obviously you and your husband had a nasty wakeup call but you are both doing the right thing and trying to change the habits of a lifetime (not an easy thing I know). Nice to see you back again Ingrid.